The target of your fishing trip - sheat-fish (Silurus glanis). 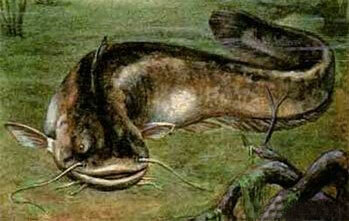 The sheat fish is a freshwater predator, a crafty and cautious fish. Some specimens have a length of up to 5m and can weigh up to 300kg. These specimens are very rare. However, specimens with a weight of 40-90 kg are caught fairly often in the mouths of the Karatal and Lepsy rivers, and in Lake Balkhash. The sheat-fish's life is unique. In spring, when he wakes up from hibernation, he leaves his winter "apartment" and heads upstream from Lake Balkhash into one of the rivers. There, he occupies holes and other deep silty parts of the river, where he eats his fill of small fish before spawning. The sheat-fish is a typical predator. It feeds mainly on other fish, and won't hesitate to eat frogs, large molluscs, and on occasion, waterfowl. Species of fish you may catch during sheat-fish fishing. The marine life of the Karatal and Lepsy rivers and Lake Balkhash includes more than 20 species of fish: sheat-fish, barbel, perch, sazan, bream, pike perch, zherekh, amur, one-color gubach, etc. In mountain rivers live osman, marinka, and rainbow trout as well. - at the mouth of the Lepsy river. You may choose one of these two. Day 1. Arrival in Almaty. Meeting at the airport. Transfer and accommodation in hotel "Otrar" ****. Breakfast. Transfer to mouth of river. Lunch en-route. Dinner. Accommodation at base camp. Overnight in tents. Day 2. Breakfast. Preparations for fishing. Boat transfer to the fishing spot. Fishing. Return to base camp. Dinner. Overnight in tents. Day 3. Breakfast. Boat transfer to new fishing spot. Fishing. Lunch. Return to base camp. Dinner. Overnight in tents. Day 4. Breakfast. Boat transfer to new fishing spot. Fishing. Lunch. Return to base camp. Dinner. Overnight in tents. Day 5. Breakfast. Fishing. Lunch. Dinner. Overnight in tents. Day 6. Breakfast. Fishing. Lunch. Lunch. Overnight in tents. Day 7. Breakfast. Transfer to Almaty. Lunch on the way. Arrival in Almaty, transfer to hotel "Otrar" ****, accommodation. Dinner in a local cafe. Overnight in hotel. Day 8. Departure from Almaty. 1. Methods of sheat-fishing - from riverbank and boat. Bait - live zherekh, bream and crucian. After successfully hooking your fish, bringing it in takes about 1 hour. Hunter-guide will help fisherman land the fish. Landing the sheat-fish is only possible after he is completely tired out. It is necessary to mention: fishing is catch and release only. 2. Weather. From April to June the weather in the fishing area is hot. Mosquitoes do not appear during April. In May and June they appear after sunset. On sunny days, especially if it is windy, they are not a problem. The weather from September to October is mainly warm, though hot days may occur. Mosquitoes are not a factor. 3. Trophy. Actual specimens of Sheat-fish in the area often are 40 cm to 2.5 m in length. Their weight may range from 5 to 150kg. 4. A helicopter may be used for flights to/from the fishing area, at a cost of $1350 per flight hour. 5. The tables beneath show the conditions of licensed fishing. 6. If you haven't any tackle, you can rent rod and reel - $80 each for the whole tour.